"The Keyblade Riku began his journey with. It provides a balanced boost in Strength and Magic." Only available during the first fight against Demon Tower. The Way to the Dawn is the default form of Riku's Keyblade, and appears in Kingdom Hearts II, Kingdom Hearts 358/2 Days, Kingdom Hearts 3D: Dream Drop Distance, and Kingdom Hearts III. Like Sora's Keyblade, it is a Keyblade of the Realm of Light. Its form is based upon the Soul Eater, which it uses as an intermediary, and its name and design reflect Riku's nature as a being halfway between both light and darkness. The Way to the Dawn is first seen in Kingdom Hearts II, when Riku arrives at The World That Never Was in order to rescue Naminé and Kairi from Saïx. Though it is technically a different weapon from the Soul Eater, Riku still refers to it by its previous name. 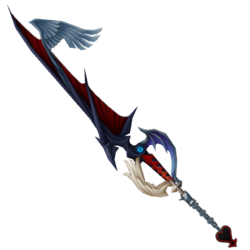 Riku can equip this Keyblade within Mission Mode in Kingdom Hearts 358/2 Days. The Way to the Dawn appears first when Riku arrives in The World That Never Was to save Kairi and Naminé and battles Saïx. Riku then continues to wield the Way to the Dawn instead of his Soul Eater as he and Kairi battle Heartless together and ultimately reconnect with Sora, and leading into his and Sora's battle against Xemnas. Riku uses the Way to the Dawn throughout his Mark of Mastery. When Riku and Mickey venture into the Realm of Darkness in order to save Aqua, they encounter the Demon Tower. After a vicious battle in which Riku is swallowed by the Demon Tower, the Way to the Dawn is shattered. Riku leaves the broken Way to the Dawn on the shore of the End of Sea for the other version of him, seeking a replacement Keyblade from Yen Sid in the form of Braveheart thereafter. The Riku Replica later wields a repaired Way to the Dawn when he appears beside Riku during Riku's battle against Anti-Aqua. 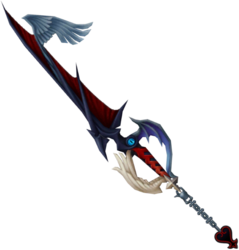 The Way to the Dawn greatly resembles the Soul Eater, but the once curved wing is now straight, and the Keyblade's guard is composed of one angelic wing and one demonic wing, similar to the guards of Sora's Oathkeeper and Oblivion keychains, respectively. Also, a dark angelic wing has been added to the top of the original blade of the Soul Eater to act as the teeth of the key. Its token is the Heartless Emblem, but without the spiked bars crossing it. In its appearances in Kingdom Hearts 3D: Dream Drop Distance and onwards, the token's design also integrates elements of the recurring Heart symbol, curling the tips of the Heartless Emblem's red outline inward at the top. Its name is derived from the ending scene of Reverse/Rebirth, in which Riku declares that he is taking the "road to dawn". The code for the Japanese release of Kingdom Hearts 2.5 HD ReMIX contains text referring to the Keychain as the "Way to the Daylight". Its respective Kingdom Hearts key ring labels it as the "Wait the Dawn". Riku can equip this weapon in Kingdom Hearts 358/2 Days mission mode by equipping the Zero Gear. There are two ground combos of this weapon. They both begin with a spinning slash, but if the player lets the combo end with an upward slash, from there Riku jumps into the air and performs two diagonal upward slashes, one from each leg. If the player continues to tap , then Riku will repeat the spinning slash three times and finish the combo with the upward slash. If is pressed before the third slash during the ground combo, a dashing thrust will be performed instead. The aerial combo consists of a upward slash from the left leg, followed by an upward slash from the right leg, another diagonal upward slash from the left, and ends with Riku slamming the sword straight down. The Way to the Dawn also appears in the secret video "The Gathering", where Ventus pulls it from the ground at the Keyblade Graveyard. On the Japanese version of the Kingdom Hearts 3D: Dream Drop Distance website, the Way to the Dawn acts as a cursor for Riku's version of the website. The Way to the Dawn appears as a 6★ Keyblade. It can be acquired from the Relic Draw during the Kingdom Hearts collaboration event. The Way to the Dawn bestows the Ultra Soul Break Dark Firaga when equipped to Riku. 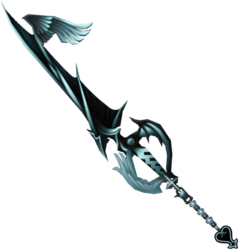 During the battle with Xemnas, Sora temporarily wields this Keyblade with a reverse grip, similar to how Ventus holds his Keyblade. During the battle against Xemnas's Dragon Form, Riku also holds this Keyblade in a reversed manner while driving. ↑ Director's Secret Report XIII, p. 28; Tetsuya Nomura: "Riku's 'Way to the Dawn' and Kairi's Keyblade are naturally the same type of Keyblade as Sora's. However there is no particular explanation for the Soul Eater's transfer and occurrence, as well as Riku's handing it to Kairi." ↑ Kingdom Hearts II, Riku: "Hmph. Not bad, Sora. You've grown stronger. You don't need my weapon, Soul Eater, or the power of the dark yet."